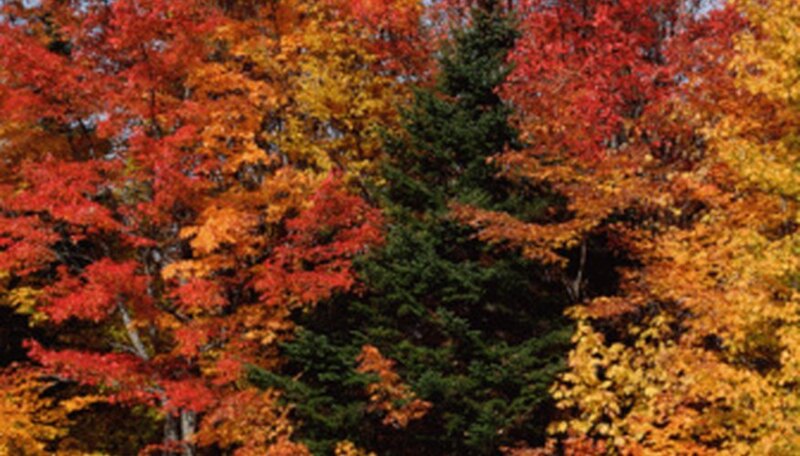 In the autumn, the temperate deciduous forest trees lose their leaves in preparation for winter. From lack of chlorophyll, the leaves become many-colored, blazing with reds, golds and oranges. A unique factor of many of the trees in the deciduous woods, unlike rainforest trees, is their seasonality--in the fall, they lose their leaves, in the winter, all is bleak and life goes on underground, in the spring, the leaves bud out again, and summer brings a full, leafy canopy. There are many types of plants in the forest that live in the middle zone (saplings, small trees), lower middle zone (shrubs), the herb layer of wildflowers and ferns and on the ground, the moss, lichen and fungi. The tree stratum, 60 to 100 feet high, is composed of trees such as oak, maple, basswood, walnut, beech, linden, sycamore and sweet gum. Conifers also live in the temperate deciduous forest, including pines, spruce and firs. 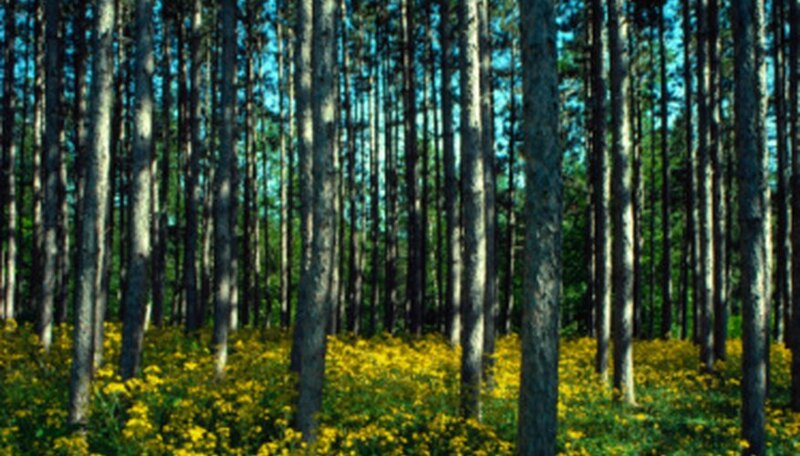 Other tree species include tulip poplar, birch, ash, buckeye and black cherry. Small trees and saplings make up this stratum. It includes not only the younger trees that may or may not grow to maturity depending on sunlight coming through the taller trees, but also smaller flowering trees such as dogwood and redbud, which decorate the deciduous forest in the spring. Ginko, shadbush and serviceberry trees also inhabit this stratum of the forest. Shrubs compose the next lower layer of the deciduous forest. Mountain laurels, rhododendrons and berry shrubs such as huckleberries, blackberries and spice bushes provide food and shade for forest creatures like the box turtle and chipmunks. The herb layer includes the flowering plants of spring, such as spring beauty, sarsaparilla, violets, jack-in-the-pulpit, trillium, purple clematis and others. Before the trees leaf out and cut off the sunlight from the earth’s floor, the woods explode with flowers. These quickly die down when the tree leaves grow in, taking away the essential light. The ground layer of the deciduous forest is home to lichens, club mosses and true mosses, which grow on the ground or on trunks of trees. Many fungi make their home here as well. Two edible species are morels and puffballs. Shelf fungi grow off the sides of trees. Mosses and lichens can cover the downed trunks of trees. The dead leaves in fall, and everything that falls from the trees and shrubs covers the ground in a rich decomposing layer, which turns in time into rich fertile soil. Neill, Patricia. 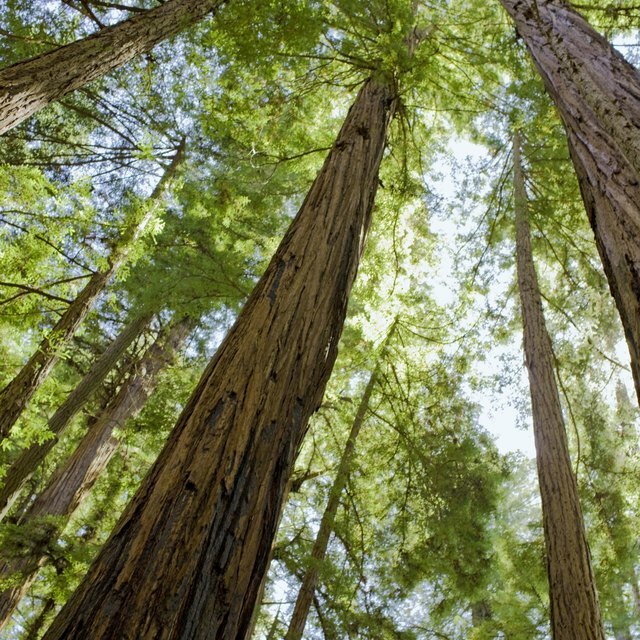 "List of Plants Unique to Deciduous Forests." Sciencing, https://sciencing.com/list-plants-unique-deciduous-forests-8174076.html. 06 August 2018.